When I took this photo a few months back I thought it illustrated quite well the type of segregation from normal roads which the CTC in Britain has always supported - the motorway on the left behind the barrier giving motorists a way of travelling faster off normal roads - vs. the type of segregation which they generally are not so supportive of - the cyclepath on which my bike and trailer and the child heading in the opposite direction are using to ride in greater safer than by sharing the road with the van. Anyway, this is really just an introduction to something I think it well worth reading elsewhere. David Arditti has written a very good piece called "1934 - The moment it all went wrong for cycling in the UK" on the history of campaigning around cyclepaths in the UK. I took the photo a few months back on the return run of one of my frequent rides to get bicycle racks from a bicycle manufacturer in Hoogeveen. We took a few days holiday last week. This time we went just a few km North from here and stayed on a campsite in the countryside. I'm not going to show you all our family holiday photos, but a few photos of what we saw are perhaps interesting. Swinging bridge in small fishing village. Note that there is just one lane for cars. Drivers have to negotiate passage over the bridge, while leaving the cycle part of the bridge for cyclists. This formed part of the cycle path which led from our campsite to the village. Home-made sign outside another village telling the drivers the names of all the children who play on the streets which they are about to drive through. We took a ferry to Schiermonnikoog, a small island (half the size of Guernsey) just North of the mainland. It's really a holiday island, accessible only by boat. It's almost completely car free - tourists are not allowed to take cars to the island. The main means of transport is the bicycle. This is a queue for the cycle hire at the ferry terminal on the island. The ferry takes a maximum of a thousand people at a time, and almost all of them join this queue for hire bikes. The only obvious "cycle path" on Schiermonnikoog leads from the ferry terminal to the island itself. To the left of this path is a road used by service vehicles (for deliveries etc.) which do drive around the island, as well as the bus service between the ferry and the hotels in the village. 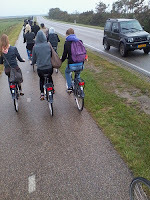 This cycle path is needed because there are a small number of commercial vehicles which come off the ferry and a couple of buses which take passengers to the village and directly to hotels. In our day on the island we saw just one private car in use. Therefore, apart from here, riding even on the "main road" is usually a car free experience. In other places other techniques are used to empty rural roads of cars. Many small children ride their own bikes around the island. More tourists enjoying cycling on the island. A video giving some of our impressions of Schiermonnikoog. We had a great time. It's really a wonderful place for a relaxing holiday, especially with young children. But perhaps not really the place for a "cycling holiday". With a size of just 17 km by 4 km, it doesn't take long until you're back where you started ! Back on the mainland... One day, the boyfriend of my eldest daughter came to visit. He brought his bike by train and we met him from the nearest railway station, in a village 12 km away. Like all Dutch train stations, this one has a lot of cycle parking even though it serves a village of just 2800 people. There are enough spaces for one in every eleven residents to park a bike at the station (I also made a video). We've covered railway station parking many times before. The journey between the railway station and our campsite was made entirely on rural cyclepaths like this one, which connect the entire country together, and maintain a level of subjective safety which makes cycling accessible to all. While I am enjoying my holidays: here's something I prepared earlier. The setting: a sunny Saturday afternoon in June, about 3 in the afternoon, an arterial route from the centre of the city of 's-Her-togenbosch to its suburbs. There are people passing in cars, on foot and on many bicycles. 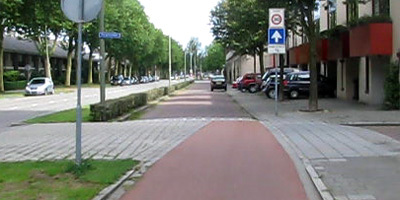 What you can see in the video is an ordinary street in the Netherlands with ordinary cycling facilities and a normal amount and type of traffic. There is motorized traffic, cars and buses, some mopeds and a lot of cyclists and some pedestrians. Each type of traffic with its own part of the street. The central two lanes are for motorised traffic, there are wide one way cycle paths on both sides shielded from that motorised traffic by a meter (3ft) wide strip of grass and there are sidewalks on both far sides. This type of arterial streets is inviting to cyclists and this is the type of infrastructure that makes cycling very convenient and easy. This six minute view in this street shows you not only that there are a lot of cyclists but also that they are very different. They are of all ages, cycle on a whole range of bicycle types and from what they have with them you can tell they cycle for a variety of reasons. We see a person carring a large musical instrument, people carrying groceries and there are people wearing sports outfits. You could also say they're all simply going from A to B. This is the face of mass cycling: relaxed and easy. If you are interested to see the exact location in Google street view you can click the link below. Convenience of cycle paths. Comparison of UK vs. Netherlands. British cyclists have good reasons to avoid cycle specific infrastructure. All too often, it's a mixed up, disjointed mess. However, this doesn't have to be so. It's really only a matter of design standards. 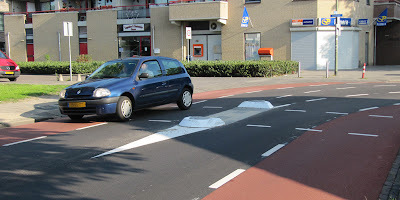 Dutch cycling infrastructure is made not as an after-thought or a box-ticking exercise. It is really meant for use. It joins up to provide a coherent grid of convenient routes which take you to all possible destinations. This is true not only within the town, but also for longer rides, such as a 100 km ride that I made recently. When cycling infrastructure gives cyclists efficient direct routes and promotes a high degree of subjective safety, that's when it can be used by the masses. For a high proportion of journeys to be made by bicycle, this attention to detail is not optional. Don't fall for the idea that there isn't enough space in Britain. That's simply not true. Towns in the Netherlands used to look a lot like towns in the UK, as you can see from before and after photos of the very same city centre streets as appear in the first video. As part of an elaborate cycle plan the city of 's-Hertogenbosch is currently updating its cycling infrastructure. The city wants to raise the modal share of cycling from 33% to 44% of all trips (Note that these figures are not reliable. They are not for "all trips" but result from not including walking as a transport mode and only considering cycling within the city). David has already written about this 2009 plan before and he has shown some of my video's with parts of the plan. Some weeks ago I showed you how (also as part of this cycling plan) new red asphalt was rolled out in another street. This blog post wil focus on one of the updates that was also finished. This was a street with a collection of cycle paths and service streets. In the new plan this street had to be updated with the latest minimal requirements to be a real main cycling route. With the update finished we see it can indeed be called a main cycling route now. We see this shift in thinking about cycling infrastructure all over the Netherlands. Governments in charge of road building (from the State, to the Provinces to the municipal authorities) think and plan much more in routes rather than in individual streets or paths. Which really is an improvement and gets the grid complete. 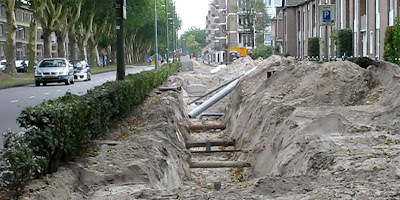 While the streets had to be redone completely, the city took the opportunity to also change all the sewer pipes, the telephone, data and electricity cables and the water and natural gas pipes. This is the usual thing to do in the Netherlands. There is good coordination between all the companies responsible for all these systems under supervision of the city or municipal authorities. This dates back from the time (not so long ago) that all these services were run by the councils themselves. 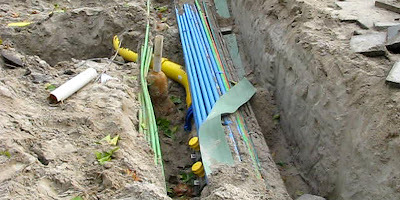 Since all cables are underground in this country it is a very good thing that there is this coordination. You wouldn't want streets to be dug up separately by all the different companies. 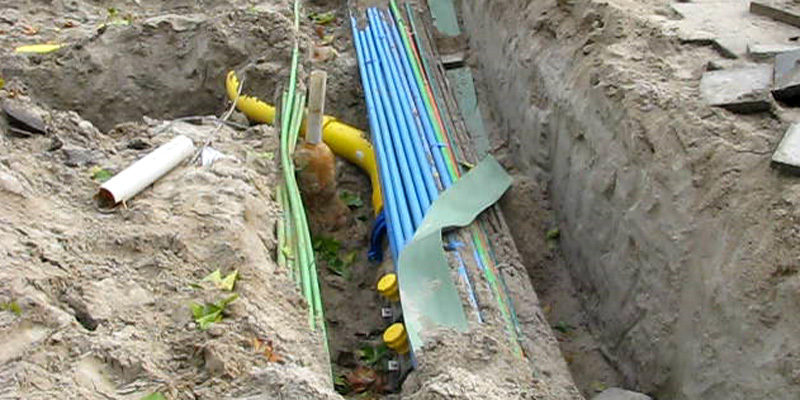 All new cables and pipes for natural gas, electricity, water, telephone, television and data. All the sewer pipes were also renewed. 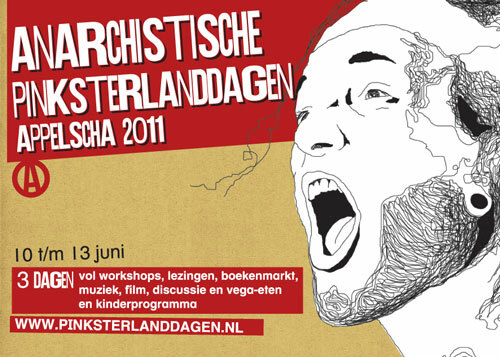 The elaborate works took place late 2009, early 2010 and the below video gives a short overview. Not only were service streets completely redone, where necessary the existing cycle paths got a far better surface as well. To see the full impact of this updated route, you can see the before and after situation in the video below. 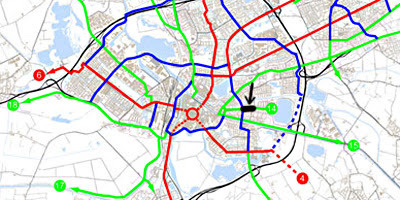 Now that so many of the works were finished, two years after the cycle plan became active, the city of 's-Hertogenbosch apparently felt confident enough to be a candidate city in the election of 'cycling city of the Netherlands 2011'. It is one of the 18 cities in the long-list in this election by the Fietsersbond (Cyclist's Union). This summer five of the cities will be chosen to go to the final election. Did you know that "London is a first category cycling city" ? It's one of the things I've learn from spending a few minutes reading about Walking and Cycling in England (they deleted their page, so I deleted the link), according to the visitengland.nl website - the Official website in Dutch for tourism in England. It makes for very interesting reading. visitlondon.com takes a slightly different line. According to them, "When you cycle through the busy traffic in London, it is of the highest importance that you wear a helmet. Some cyclists also use face masks. Make sure that you're seen by other road users: wear reflective clothing." That doesn't sound quite like a "first category cycling city" to me. For more views of London, check out earlier posts or bloggers from the city listed on the right. You perhaps expect tourism websites to make positive claims for the places they're selling, but at what point does exaggeration become dishonesty ? I used to mainly take the B-road alternative routes. They are a little more civilised than the A roads, but make your journeys longer. However, would you ride here with children ? We don't know which route they took. If they were looking for a relaxing holiday they'd have been best off getting on the next ferry back to the Netherlands - we'd taken our bikes in the opposite direction for a reason. This is what doesn't happen in the Netherlands. You can go everywhere without having to "share the road" with motor vehicles travelling at 100 km/h. It is quite practical to set off with children and cycle to interesting places at a considerable distance. The destination will be reachable by bike, and the journey will be pleasant. Unfortunately, the Metropolitan Police have found it to be completely impossible to work out who this driver is. Compare and contrast with another Dutch language tourism website which says that the English behave as gentlemen on the roads. Actually, I've heard several Dutch people express such an opinion. It's similar to how British people express an opinion about Dutch or French drivers. The reason is simple: people get an inaccurate impression from short holidays. On holiday you stay in one place only for a short period, reducing your exposure to problems, tend to avoid rush-hour, mostly ride in places other than the centres of cities, don't have any memory of where previous incidents occurred and of course you wear the most rose-coloured of glasses. I don't believe that drivers behave very much differently in one country vs. another. However, our rose coloured spectacles about the Netherlands came off a very long time ago but it remains less stressful to cycle here. The reasons are simple: In the Netherlands, cyclists interact rarely with motorists. Where there are interactions it is obvious who has priority. That's what makes the experience here different. There's a reason why you regularly see school trips by bike here, but not in Britain. The first website also says that "Northumbria has the most beautiful, well marked cycle paths" which "criss-cross through the area and take you to interesting places". I'd like to know where they are. It is a lovely area, but when we were on holiday there, all our cycling was on roads (a comment points to this cycle path in Northumberland). There's a lot of exaggeration about: Another British tourism website claims that Rutland Water is the largest artificial lake in western Europe, which is a bit weird given that it covers only one hundredth of the area of the IJsselmeer. The video was also featured on crap walking and cycling in waltham forest and as easy as riding a bike. There's more on London, Britain and exaggeration. 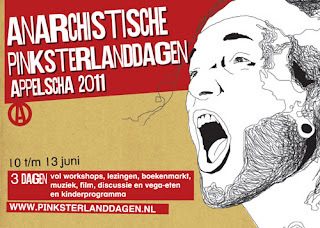 A couple of weekends ago we cycled over to the anarchist festival in nearby Appelscha. It was a very peaceful event, alcohol and drug free, with friendly people who had gathered from all around Europe and further afield to share tasty vegan food, indulge in lots of interesting discussion and look through books and leaflets on an abundance of stalls. A sign in the tea shop read "First a cup of tea, then the revolution". I thought this summed it up quite well. While there were very passionately held beliefs amongst the group, there was little, if any, enthusiasm for violent rebellion. Don't get the wrong idea. I like this. Anyway, there were other aspects which amused me. One group of people from Scheveningen are organising a DIY Bike Festival in August. It's very much an imported "bike culture" event. For instance, they're going to have a "critical mass". This is quite a strange thing to see in an established bike culture. The term "critical mass" as applied to cycling originated from "Return of the Scorcher", a film made by Ted White in 1992 where one of the interviewees reflected on how a "critical mass" of cyclists seen in China were able to force their way through motorized traffic. It was an appreciation of this, and a desire to have a real cycling culture, which resulted in the term being used to describe the events which now take place in many cities around the world where cycling is under pressure. I wish the organisers all luck and success with their event, but can't help but feel that to bring this back to the Netherlands is to misunderstand what it is in the first place. It was also possible to pick up a nicely made leaflet called "a rough guide to bicycle maintenance" which apparently dates back to "the 2003 portland zine symposium" (all lower case letters are theirs, not mine). The first step in the instructions for how to fix a flat is to "remove the wheel from the bicycle". This is again out of place. Where there is an established bike culture where bikes commonly have hub gears, hub brakes, chaincases and other practical things, it is more time consuming to remove a wheel and most people will first patch the tube without removing the wheel. It's the wrong lesson in this context. Just inside the door of the cafe was a collection of traditional Dutch style bicycles pumps. If you had a flat tyre, you were actually in the right place here. The presence of these pumps, and the collection of bikes behind the cafe, are sure signs of a real, thriving bicycle culture. However, it's a bike culture that the Dutch often don't even realise is special. I like events for "cyclists". I like riding unusual bikes. I also like to see people doing what the people in Scheveningen are doing, in organising their event. I wish them the best of luck with it. However, what I really celebrate, and what makes cycling in the Netherlands extraordinarily special, is that normal people on bikes, in their millions, go about their everyday business by bikes. On the way home we saw this man with an implausible large object on his bike. You don't need a special "cycling culture" for people to do this, when there are proper cycle-paths which make true mass cycling possible, this is just normal. There is a danger here for the Netherlands. Many of the things which make this country special are not appreciated by the locals so much as they are by those of us who moved here in order to be a part of it. If the Netherlands takes its cue for what a cycling culture should be from countries with less cycling, then it is likely that what will actually happen is that cycling will become more marginalized, just as it is in those other countries. In fact, just as it is to a greater or lesser extent in every country but this one. In this country, cyclists are not an out-group. Cycling is not a revolutionary activity in the Netherlands. Nor does it need to be made into one. 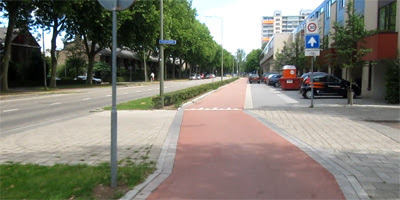 If you want to achieve a real cycling culture in a country other than the Netherlands, there is no other country which provides a better example. Sadly, China is no longer the inspiration that it was when it inspired the film-maker in 1992.